Fellow freelance writer Gus Mastrapa dug into the new Ys Seven game in and came up with some good points on this entertaining JRPG action adventure. You can read his fine review, along with my second opinion on the game, in the latest digital edition of EGMi. Peep the review in the new issue here. 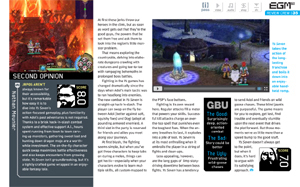 This entry was posted in EGM/EGMi and tagged EGM, EGMi, jrpg, PSP, Review, ys seven by nmeunier. Bookmark the permalink.